Thanks, Kass. I have a copy, but only single sided. Now I can make up a facsimile edition. Great stuff! How did you find it?!! LOL I have a printed/bound copy of this pdf...it's one of the BEST sources I've ever seen, I can't believe there isn't an edition in print. Thank you for the wonderful links. I am very grateful. 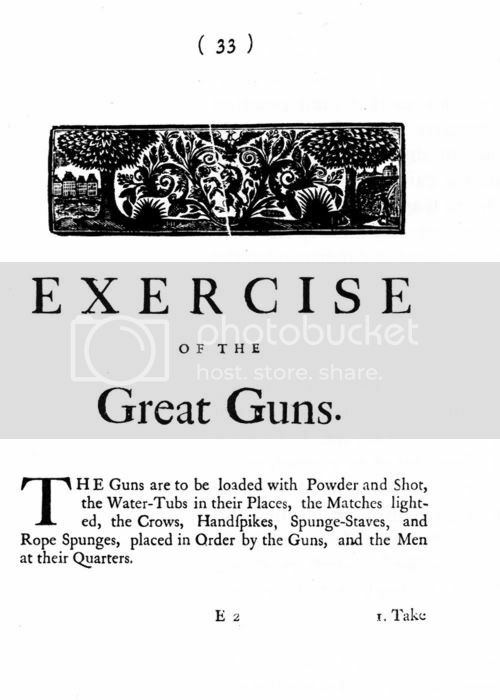 I have a pdf for the Exercising of the Great Guns, but I cannot find the original link for it. If anyone would like a copy, drop me your email into a PM. It's 12 pages and it goes through the step by step of firing great guns. Do you mean this, William? Kass, you are the best. That was some GOOD STUFF! I thought you guys might like those. I just found it by accident when looking for something else. Thank the guy who put up the website! Location:God willing some where near Beaufort on the water! Interests:I am one of the few 6 foot 1in female pyrates I know, I have been known to crew with the good Schooner Night Hawk and her vixen Capt. Siren. Beaufort NC is my port-o-call but alas I do reside a bit inland. I have sailed Black Beards water for years off the coast of NC. I am also a Ghost Hunter with SAGE Investigations.<br>Black Powder, Mc's, Rum, and slinging steel with my son make me happy. KASS ROCKS!!!!!!! Thank you for the links!!!!! My son has burnt the printer up for the past hour!!!! Nope. That has a lot more detail about the exact details that a Master Gunner should know about ordinance, firing distances and the like. The Exercising of the Great Guns is a step by step of the preparation of one pre measured weight of powder and all the steps to load and fire a cannon. It is a primary step by step that a gunner must perform when firing a gun. The quick how to for the common gunner. Edit: DAAAAMN. I cannot find the original page anywhere, but here is what it looks like. Interests:Underwater Photography, Pyrates of all kinds, Maratime History, Marine Power systems, Naval Arcetecture. I've got the same Adobe Reader version and it works fine. Use a different browser if you have to. Not your book, but I found one called Exercise of the Small Arms and Great Guns for the Seamen on Board His Majestyos Ships (1778) May this contain similar info? It's 50 years off GAoP period, but surely there must be SOME applicability. I will keep looking for your title, also. It very well might. I'd love that link or info as well. Outstanding. Thank you Mad Matt. I can't wait t' get my hands on a copy! Interests:Pillaging, plundering, rifling and looting of course. Now wheres the damn rum? These four should give you a good bit of information as I know the other three, as well as my own, try to research pretty in depth for historical accuracy as possible, from original source documents when possible. Location:+30° 26' 18.00", -97° 55' 18.00"
Everything you ever wanted to know about Pirates, Privateers, Explorers, Buccaneers, Sailing, Shipwrecks and Nautical Archaeology.